Bath and former England prop David Flatman has announced his immediate retirement from rugby due to a hand injury. The loose-head revealed the news on Twitter with a comment that read: "Today I announce my retirement from rugby. I've given everything, had a wonderful time and feel incredibly proud to have played. Thank you." Flatman's decision to call time on his career sees him depart from the game with eight England caps and numerous appearances for Saracens and Bath in the Premiership. At international level, Flatman played in the England side that last won in South Africa - back in 2000 - and also recorded a win over Argentina in Buenos Aires. 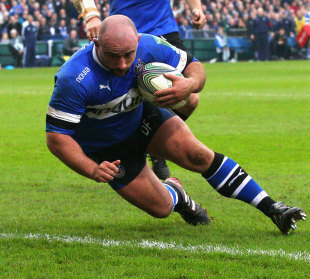 At club level, Flatman helped Bath towards lifting the European Challenge Cup in 2008 and has become an integral part of their front-row over the years. Talking about the hand injury, Flatman told ESPN: "It happened a couple of games before the end of the season. It's something that I didn't take too seriously at the time as you get a lot of bumps and bruises but it got progressively worse to the point where I had to go and see a specialist about it. "The news wasn't getting any better and after a couple of difficult conversations it became a situation where it no longer became a 'decision' for me, the choice was taken away from me. If you had asked me to chose I'd be there on Monday, but unfortunately the ramifications meant that it was right that I had to call time on the rugby. Had I been 22 and only played a handful of games for Bath then I'd have felt different, but I'm 32 and have enjoyed a long career."